Another price drop on this sensor in case anyone needs a few more. The Xiaomi Aqara smart windows door sensor can detect the opening and closing of door and windows and send a notification to your phone via the APP. With the ability of matching with other Xiaomi smart devices such as gateway remote control, smart bulb, air cleaner, etc. this sensor is able to help you create a smart home. The windows door sensor consists of a sensor subject and a magnet. It detect the opening and closing of door and windows by sensing the near and separation of the sensor subject and magnet. What's the difference between this and the rounded one? Great price, cheapest i've gotten them was £5.30 last week. Will order a couple more now so I can use them by next black friday. These run on the zigbee protocol so should work with smart things. My motion sensor has arrived, still awaiting for the above to arrive and the hub which were ordered a few weeks ago. I think this is the 2nd gen one. No change in functionality I think, just different shape. These are 2nd generation ones. Rounded one were the 1st ones to come out. I'll go for 2nd gen ones just to be sure for better compatibility. I don't have any but looking into smart up my home. I purachsed some of these along with the Aqara buttons, a humidity sensor and the gateway. Only when i received them did i realise that they cant be used on the SIngapore server. For full functionality they can only be used on the Mainland China server. Which if you have Yeelights that you use with Alexa/Google home, you cannot use on the Mainland China server due to Xiaomi having their own version of Alexa in China. So it seems you have a choice between full Xiaomi smart home, or Alexa/Google Home. Wish i'd have know that before buying. 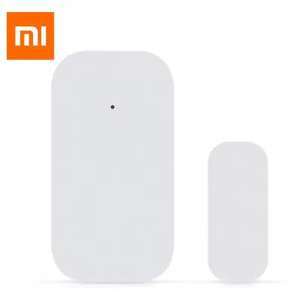 This item must match the xiaomi multifunctional gateway to use." Is it not a standalone device to just fit to a door/window? Also, if you get more than one (back door, side door etc.) can you monitor them individually? "Please Note: This item must match the xiaomi multifunctional gateway to …"Please Note: This item must match the xiaomi multifunctional gateway to use. "What does this mean?Is it not a standalone device to just fit to a door/window?Also, if you get more than one (back door, side door etc.) can you monitor them individually? No they are not stand alone, they need a hub to connect to, £30~ I believe, although kits can be had for £45~ with the hub and several sensors/buttons. I purachsed some of these along with the Aqara buttons, a humidity sensor …I purachsed some of these along with the Aqara buttons, a humidity sensor and the gateway. Only when i received them did i realise that they cant be used on the SIngapore server. For full functionality they can only be used on the Mainland China server. Which if you have Yeelights that you use with Alexa/Google home, you cannot use on the Mainland China server due to Xiaomi having their own version of Alexa in China. So it seems you have a choice between full Xiaomi smart home, or Alexa/Google Home. Wish i'd have know that before buying. Can the yeelights not be used on the Chinese server at all? The yeelight can be used on the China sever no problem but Google home assistant won't see them unless they are on the Singapore server. I've just switched my yeelight to the Singapore server and they work fantastic! I've got the gateway and sensors on order (not yet received), so I might revert everything back to the China sever for now and forget about Google home. I'm hopeful that Xiaomi could just make everything compatible in the near future. Yes definitely works with Smartthings - as does the Xiaomi motion sensor, temperature sensor and also the buttons (but not wall switches). You need the custom DTH available from the Smartthings community. Just use two different Xiaomi accounts and should be good to go no? I think this I what I might do. The only downside is that the gateway won't be able to interact with the yeelights, for example, door opens and a yeelight switches on. I'd rather have the yeelights controllable with Google home assistant and leave the gateway to look after the sensors etc. I think this I what I might do. The only downside is that the gateway …I think this I what I might do. The only downside is that the gateway won't be able to interact with the yeelights, for example, door opens and a yeelight switches on. I'd rather have the yeelights controllable with Google home assistant and leave the gateway to look after the sensors etc. Looks as though there is conversation around mi home gateway set up with the singapore server! You can use seprate accounts, but then they wont link. So in theory i could put all the Xiaomi gateway and sensors on one account on the China server, and the Yeelights on a seperate account on the Singapore server and they would work seperate from each perfectly. But the whole point i bought the gateway was to use the Aqara switches with the Yeelights. So as well as having Alexa control and smartphone/watch control we also have a physical button near the traditional lightswitch. But at present this isnt possible. You can use seprate accounts, but then they wont link. So in theory i …You can use seprate accounts, but then they wont link. So in theory i could put all the Xiaomi gateway and sensors on one account on the China server, and the Yeelights on a seperate account on the Singapore server and they would work seperate from each perfectly. But the whole point i bought the gateway was to use the Aqara switches with the Yeelights. So as well as having Alexa control and smartphone/watch control we also have a physical button near the traditional lightswitch. But at present this isnt possible. Same here. I wanted to pair the motion sensor with the yeelights along with having Google home functionality. Hopefully they'll provide an update. Otherwise I'll have to make a decision on living without Google Home functionality but linking the sensors to the yeelights. I thought voice automation was a gimmick but I've been using assistant on my phone to control the lights and it's becoming second nature. Same here. I wanted to pair the motion sensor with the yeelights along …Same here. I wanted to pair the motion sensor with the yeelights along with having Google home functionality.Hopefully they'll provide an update. Otherwise I'll have to make a decision on living without Google Home functionality but linking the sensors to the yeelights.I thought voice automation was a gimmick but I've been using assistant on my phone to control the lights and it's becoming second nature. On a positive note, There was an update to the MiHome app a couple of weeks ago, and you can now add the Gateway to an account on the SIngapore server along with the Aqara switches, but they dont do anything and you cant access the device settings. They just sit on your list of devices. So you can add them, but not do anything with them. Ive scoured the forums the last few days hoping to find a fix, but there isnt one. Just a matter of waiting for Xiaomi to switch the Singapore server on for all devices, and seeing as Xiaomi's support and customer contact/press releases about updates is non existant, there is no way of knowing when this will be. Just hope the recent update of being able to actually add the devices means it will happen some time soon. …http://forum.yeelight.com/t/finally-mihome-gateway-supports-singapore-server/2470/18Looks as though there is conversation around mi home gateway set up with the singapore server! On a positive note, There was an update to the MiHome app a couple of …On a positive note, There was an update to the MiHome app a couple of weeks ago, and you can now add the Gateway to an account on the SIngapore server along with the Aqara switches, but they dont do anything and you cant access the device settings. They just sit on your list of devices. So you can add them, but not do anything with them. Ive scoured the forums the last few days hoping to find a fix, but there isnt one. Just a matter of waiting for Xiaomi to switch the Singapore server on for all devices, and seeing as Xiaomi's support and customer contact/press releases about updates is non existant, there is no way of knowing when this will be. Just hope the recent update of being able to actually add the devices means it will happen some time soon. Any maybe fellow Chinese/mandarin speakers hukkers can help by getting in touch with them. Might bear some fruit. But you're right, the hub etc being able to be added to the Singapore servers might mean an update to use them in imminent. Here's hoping. I have a houseful of then connected to a Smartthings hub. I use the first generation ones. which initially are a ball ache to pair. Once you know how to do it it is simple and quick. I take these sensors over the Smartthings ones any day of the week. I have a houseful of then connected to a Smartthings hub. I use the first …I have a houseful of then connected to a Smartthings hub. I use the first generation ones. which initially are a ball ache to pair. Once you know how to do it it is simple and quick. I take these sensors over the Smartthings ones any day of the week. I have sensors and devices by other companies too including Smartthings. Everything works happily together. Everything talks the same language irrespective of maker. Deal posting newbie! This is samyt79 first deal post. Help out by leaving a posting tip or just to show your appreciation for their contribution.